For other uses, see Ring Road (disambiguation). "Beltway" redirects here. For the term used in American politics, see Inside the Beltway. "Periférico" redirects here. For Mexico City's beltway, see Anillo Periférico. A ring road (also known as beltline, beltway, circumferential (high)way, loop or orbital) is a road or a series of connected roads encircling a town, city, or country. The most common purpose of a ring road is to assist in reducing traffic volumes in the urban centre, such as by offering an alternate route around the city for drivers who do not need to stop in the city core. 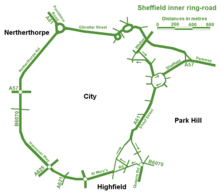 The name "ring road" is used for the majority of metropolitan circumferential routes in the European Union, such as the Berliner Ring, the Brussels Ring, the Amsterdam Ring, the Boulevard Périphérique around Paris and the Leeds Inner and Outer ring roads. Australia, Pakistan and India also use the term ring road, as in Melbourne's Western Ring Road, Lahore's Lahore Ring Road and Hyderabad's Outer Ring Road. In Canada the term is the most commonly used, with "orbital" also used, but to a much lesser extent. In Europe, some ring roads, particularly those of motorway standard which are longer in length, are often known as "orbital motorways". Examples include the London Orbital (188 km) and Rome Orbital (68 km). Bypasses around many large and small towns were built in many areas when many old roads were upgraded to four-lane status in the 1930s to 1950s, such as those along the Old National Road (now generally U.S. 40 or Interstate 70) in the United States, leaving the old road in place to serve the town or city, but allowing through travelers to continue on a wider, faster, and safer route. Construction of fully circumferential ring roads has generally occurred more recently, beginning in the 1960s in many areas, when the U.S. Interstate Highway System and similar-quality roads elsewhere were designed. Ring roads have now been built around numerous cities and metropolitan areas, including cities with multiple ring roads, irregularly shaped ring roads, and ring roads made up of various other long-distance roads. London has three ringroads (the London Orbital, the North and South Circular routes, and the Inner Ring Road). Other British cities have two (Birmingham, Leeds, Sheffield, Norwich and Glasgow). 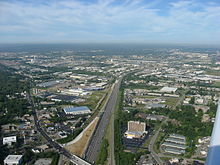 Columbus, Ohio, in the United States, also has two, while Houston, Texas will have three official ring roads (not including the downtown freeway loop). Some cities have far more – Beijing, for example, has six ring roads, simply numbered in increasing order from the city center (though skipping #1). Geographical constraints can complicate or prohibit the construction of a complete ring road. For example, the Baltimore Beltway in Maryland crosses Baltimore Harbor on a high arch bridge, and much of the partially completed Stockholm Ring Road in Sweden runs through tunnels or over long bridges. However, some towns or cities on seacoasts or near rugged mountains cannot have a full ring road, such as Dublin's ring road; or, in the US, Interstate 287, mostly in New Jersey (bypassing New York City), or Interstate 495 around Boston, none of which completely circles these seaport cities. Adjacency of international boundaries may also prohibit ring road completion in other cases. Construction of a true ring road around Detroit is effectively blocked by its location on the border with Canada; although constructing a route mostly or entirely outside city limits is technically feasible, a true ring around Detroit would necessarily pass through Canada, and so Interstate 275 and Interstate 696 together bypass but do not encircle the city. Sometimes, the presence of significant natural or historical areas limits route options, as for the long-proposed Outer Beltway around Washington, D.C., where options for a new western Potomac River crossing are limited by a nearly continuous corridor of heavily visited scenic, natural, and historical landscapes in the Potomac River Gorge and adjacent areas. When referring to a road encircling a capital city, the term "beltway" can also have a political connotation, as in the American term "Inside the Beltway", derived metonymically from the Capital Beltway encircling Washington, D.C. Most orbital motorways (or beltways) are purpose-built major highways around a town or city, typically without either signals or road or railroad crossings. In the United States, beltways are commonly parts of the Interstate Highway System. Similar roads in the United Kingdom are often called "orbital motorways". 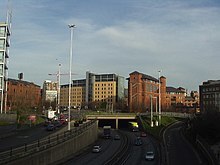 Although the terms "ring road" and "orbital motorway" are sometimes used interchangeably, "ring road" often indicates a circumferential route formed from one or more existing roads within a city or town, with the standard of road being anything from an ordinary city street up to motorway level. An excellent example of this is London's North Circular/South Circular ring road. In some cases, a circumferential route is formed by the combination of a major through highway and a similar-quality loop route that extends out from the parent road, later reconnecting with the same highway. Such loops not only function as a bypass for through traffic, but also to serve outlying suburbs. In the United States, an Interstate highway loop is usually designated by a three-digit number beginning with an even digit before the two-digit number of its parent interstate. Interstate spurs, on the other hand, generally have three-digit numbers beginning with an odd digit. Circumferential highways are prominent features in or near many large cities in the United States. In many cases, such as Interstate 285 (also known as the Perimeter) in Atlanta, Georgia, circumferential highways serve as a bypass while other highways pass directly through the city center. In other cases, a primary Interstate highway passes around a city on one side, with a connecting loop Interstate bypassing the city on the other side, together forming a circumferential route, as with I-93 and I-495 in the area of Lawrence, Massachusetts. However, if a primary Interstate passes through a city and a loop bypasses it on only one side (as in the Wilmington, Delaware, area), no fully circumferential route is provided. Route numbering is challenging when a through highway and a loop bypass together form a circumferential ring road. Since neither of the highways involved is circumferential itself, either dual signage or two (or more) route numbers is needed. The history of signage on the Capital Beltway around Washington, D.C., is instructive here. Interstate 95, a major through highway along the U.S. East Coast, was originally planned as a through-the-city route there, with the Beltway encircling the city as I-495. The portion of I-95 entering the city from the south was soon completed (and so signed), primarily by adapting an existing major highway, but the planned extension of I-95 through residential areas northward to the Beltway was long delayed, and eventually abandoned, leaving the eastern portion of the Beltway as the best Interstate-quality route for through traffic. This eastern portion of the Beltway was then redesignated from I-495 to I-95, leaving the I-495 designation only on the western portion, and the completed part of the planned Interstate inside the Beltway was redesignated as a spur, I-395. A few years later, the resulting confusion from different route numbers on the circumferential Beltway was resolved by restoring I-495 signage for the entire Beltway, with dual signage for I-95 for the highway's concurrent use as a through Interstate on its eastern portion. The longest complete beltway in the United States is Interstate 275, an 83.71-mile (134.72 km) loop in Ohio, Indiana, and Kentucky that forms a complete beltway around the Cincinnati, Ohio area. It encloses an area of over 250,000 acres. Houston—Interstate 610, Beltway 8, and the Grand Parkway. Pittsburgh—Interstate 79, the mainline Pennsylvania Turnpike and the Allegheny County belt system. (all de facto or, in the case of the latter, largely on surface streets) The Southern Beltway, which is currently under construction, will serve as a true beltway. There are other U.S. superhighway beltway systems that consist of multiple routes that require multiple interchanges and thus do not provide true ring routes. A designated example is the Capital Beltway around Harrisburg, Pennsylvania using Interstate 81, Interstate 83, and Pennsylvania Route 581. Edmonton, Alberta has two ring roads. The first is a loose conglomeration of four major arterial roads with an average distance of 6 km (4 mi) from the downtown core. Yellowhead Trail forms the northern section, Wayne Gretzky Drive/75 Street forms the eastern section, Whitemud Drive forms the southern and longest section, and 170 Street forms the western and shortest section. Whitemud Drive is the only section that is a true controlled-access highway, while Yellowhead Trail and Wayne Gretzky Drive have interchanges and intersections and are therefore both limited-access roads. 170 Street and 75 Street are merely large arterial roads with intersections only. The second and more prominent ring road is named Anthony Henday Drive; it circles the city at an average distance of 12 km (7.5 mi) from the downtown core. It is a freeway for its entire 78-kilometre (48 mi) length, and was built to reduce inner-city traffic congestion, created a bypass of Yellowhead Trail, and has improved the movement of goods and services across Edmonton and the surrounding areas. It was completed in October 2016 as the first free-flowing orbital road in Canada. Stoney Trail is a ring road that circles the majority of Calgary. The southwest portion of the freeway is currently under construction. Winnipeg, Manitoba has a ring road which is called the Perimeter Highway. It is designated as Manitoba Highway 101 on the north, northwest and east sides and as Manitoba Highway 100 on the south and southwest sides. The majority of it is a four-lane divided expressway. Saskatoon, Saskatchewan has a ring road named Circle Drive. It is designated as Saskatchewan Highway 16 on the east and north, and as Saskatchewan Highway 11 on the south, and simply as Circle Drive on the west. Regina, Saskatchewan has a partial ring road which is named Ring Road; however, due to the city's urban growth since the road was originally constructed, it no longer functions as a true ring road and has instead come to be used partially for local arterial traffic. A new outer ring, the Regina Bypass, is under construction. Sudbury, Ontario has a partial ring road consisting of the Southwest and Southeast Bypasses segment of Ontario Highway 17, and the Northwest Bypass segment of Ontario Highway 144. Most major cities in Europe are served by a ring road that either circles the inner core of their metropolitan areas or the outer borders of the city proper or both. In major transit hubs, such as the Île-de-France region surrounding Paris and the Frankfurt area, major national highways converge just outside city limits before forming one of several routes of an urban network of roads circling the city. Unlike in United States, route numbering is not a challenge on European ring roads as routes merge to form the single designated road. However, exit and road junction access can be challenging due to the complexity of other routes branching from or into the ring road. One of the most renowned ring roads is the Vienna Ring Road (Ringstraße), a grand boulevard constructed in the mid-19th century and filled with representative buildings. Due to its unique architectural beauty and history, it has also been called the "Lord of the ring roads", and is declared by UNESCO as part of Vienna's World Heritage Site. In Iceland, there is a 1,332 km ring road, called the ring road (or Route 1), around most of the island (excluding the Westfjords). Most of the country's settlements are on or near this road. Beijing, China - six ring roads encircling the city. ^ "Northeast Anthony Henday Drive". www.northeastanthonyhenday.com. Retrieved 2016-09-15. ^ Google (December 1, 2016). "Length of Stoney Trail" (Map). Google Maps. Google. Retrieved December 1, 2016. ^ Malathronas, John (24 April 2015). "Vienna's Ringstrasse celebrates 150 years". edition.cnn.com. CNN. Retrieved 2016-09-15. ^ "Historic Centre of Vienna". whc.unesco.org. UNESCO World Heritage Centre. Retrieved 2016-09-15.